A distinctive lava flow morphology that has been appearing in our dredges is pillow lava. Pillow lavas form when hot lava flows into water and cools rapidly, creating long tubes and bulbous pillow-shaped mounds of rock. Pillow lavas are found not only in the ocean but also under glaciers that overlie volcanoes. They are a classic geological indicator that the area you are standing in was once under water. Pillow lavas are a very common eruption product, especially on seamounts, so understanding something about the conditions under which they form can help us understand how seamounts form. In cross-section pillow lavas are characterized by a coarse-grained center (slow cooling, so large crystals have time to form) and a fine-grained outer rim (the lava solidifies almost immediately so few crystals can form). 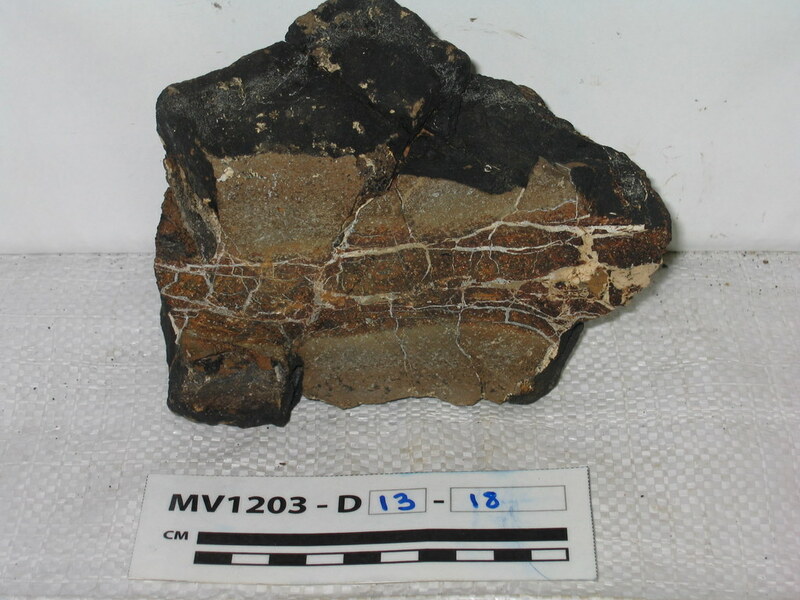 Since lava often cools quite violently when immersed in cold water, pillow lavas are often surrounded by a layer of shattered fragments of glass (black rock that does not have a regular crystal structure). The thickness of this zone (see picture at left) tells us how quickly the pillow cooled. If many pillows are deposited on top of each other, underlying pillows can keep the upper ones warm and minimize the amount of glass that is produced. 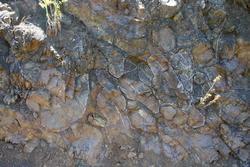 Depending on the depth at which they form, pillow lavas may also have varying amounts of vesicles. Most magmas contain dissolved gases which remain in solution when the magma is under great pressure, deep in the earth. As the magma is extruded onto the earth’s surface or under water, the gas comes out of solution and expands, forming cavities in the solidifying rock. It may also try to escape upwards, cutting out a path in the still partially-molten core of the pillow. These gas expansion traces can be an interconnected network of pore space throughout the rock, individual round vesicles, or elongated pipe vesicles. Pipe vesicles are an indicator that the pillow formed at relatively shallow depths and on a relatively low slope. An increased slope would cause the gases to be sheared out horizontally instead of forming vertical columns. 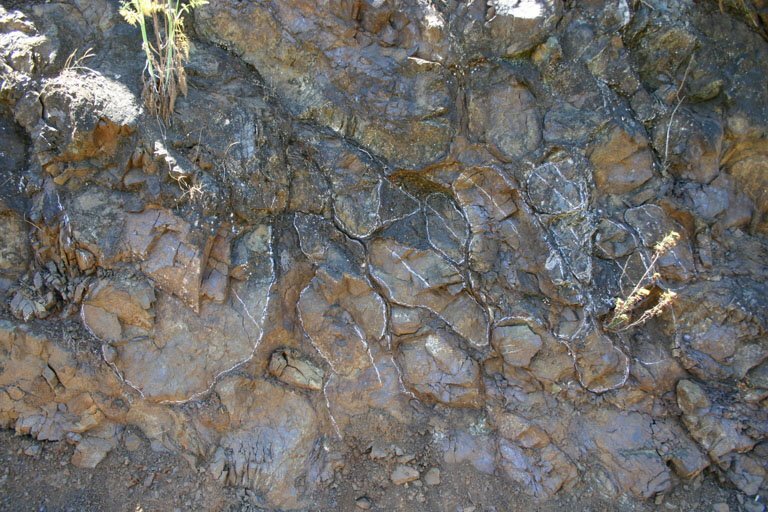 The shapes that pillow lavas take result from an interplay between the viscosity of the flow (how quickly it moves forward) and its cooling rate (how quickly a solid crust forms on the outside and slows the forward movement of the flow). Many factors may affect these properties. For example, lavas that contain more silica are also more viscous and flow more slowly, so they will form larger pillows. Pillow lavas also tend to form on slopes, where the lava can flow and stretch out further before solidifying. A higher extrusion rate may also create larger pillows. After a chilled crust is formed, lava is still being pumped into the pillow, causing it to inflate and grow larger like a balloon until the crust breaks out and a new tube is formed. In conclusion, pillows are not only very beautiful and distinctive to look at, but they can tell us something about the environment in which they formed. On this cruise we are retrieving mostly just smaller pieces of pillows so we can’t study the shape and size of entire pillow lobes (image above shows a mound of pillows preserved on land). However, we can study the many vesicles we have observed in our pillow samples, and we will be doing more of this once we get back to land.